My boys are huge fans of the show WILD KRATTS on PBS. Do you guys have kids that watch it? I have to say, this may be one of my favorite shows that my kids watch. It’s a show about two brothers who explore the world, animals and science and always teach wonderful lessons about respecting the world, our environment and animal life. It’s geared towards kids ages 6-10, and my boys are 6 & 9 so they are right in there, but we’ve been watching it for several years now with a captivated house. Airing this Monday, January 21st, is a special Wild Kratts episode. We saw it with an early screener over the holidays and my boys were enthralled. 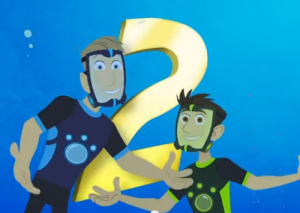 It’s a two-episode special basically about the Kratt brothers going on an underwater adventure. To top it off, PBS Kids will be launching some new science games on the website in conjunction with the special so check that out as well! Here’s a short video preview you can check out of the special and be sure to tune in Monday, January 21st for your kids to watch.